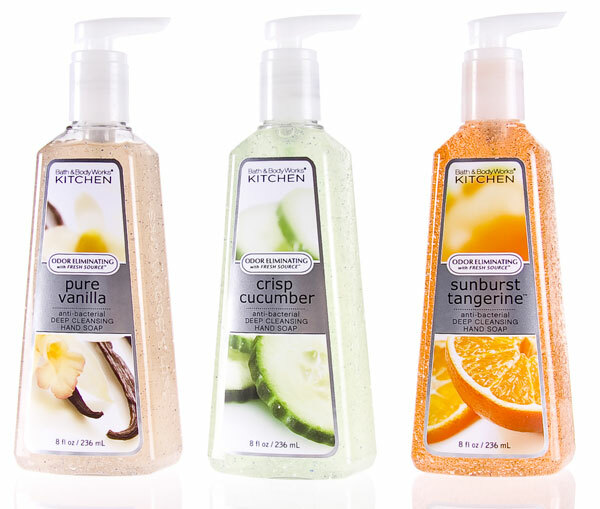 Anti-Bacterial Gentle Foaming Hand Soap: Specially designed to fight germs and eliminate odors for healthy, clean hands in the kitchen, this gentle yet powerful formula kills common kitchen bacteria with trusted anti-bacterial agents while Fresh Source odor eliminators get rid of lingering cooking smells. An exclusive blend of moisturizing coconut milk and olive fruit extracts helps to nourish and soften skin, while mango fruit extract leaves hands gently cleansed and conditioned. Anti-Bacterial Deep Cleansing Hand Soap: Get a powerful deep clean in the kitchen with this bacteria-fighting formula. Developed with Fresh Source and potent germ-killers, the deep cleansing soap employs exfoliating microspheres and cleansing bamboo extract for smooth, soft, ultra-clean hands. A moisturizing blend of honey, coconut milk and olive fruit extracts nourishes and softens. Anti-Bacterial Hand Gel Sanitizer: While powerful anti-bacterial agents combat germs and Fresh Source eliminates odors, moisturizing Tahitian Palm Milk leaves hands feeling clean and conditioned with this waterless gel sanitizer. Moisturizing Hand Lotion: Developed to eliminate odors while nourishing kitchen-worn hands, this hydrating formula includes Vitamin E, Macadamia Oil, Oat, Apple and Grape Seed extracts to condition and soften. Fresh Source gets rid of lingering cooking smells as the formula moisturizes, leaving hands hydrated and freshly scented. WHERE TO FIND: Bath & Body Works, Bath & Body Works stores or www.bathandbodyworks.com. For store locations, call 1-800-756-5005.